Jonathan received his B.A. from The University of Maine and took a Ph.D. from the Department of Philosophy at Purdue University, where he then worked as an NSF-funded postdoctoral researcher in Biomedical Engineering. 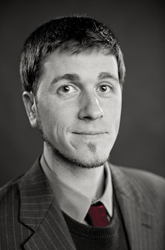 Jonathan Beever is currently a Post-Doctoral Scholar at The Rock Ethics Institute at Penn State University. He received his Ph.D. in philosophy from Purdue University in 2012 and held an NSF-funded postdoctoral research appointment in biomedical engineering at Purdue. In his current position he continues ongoing work and is developing new research projects around issues in ethics, science, and the environment. Beever has published on a wide range of interrelated topics including ethics and biotechnologies, ethics pedagogy, biosemiotics, environmental ethics, and postmodern environmental politics. He has held fellowships with the Kaufmann Foundation in entrepreneurship, the Aldo Leopold Foundation in conservation ethics, and the Global Sustainable Soundscape Network in soundscape ethics, among others. Beever is a member of the team from Purdue awarded one of the NSF’s 2012 competitive multi-year grants within their Ethics Education for Science and Engineering program and continues work as a consultant on that project.